IDC interviewed three organizations using Amazon DynamoDB to learn more about their use cases and impressions of the technology and service. 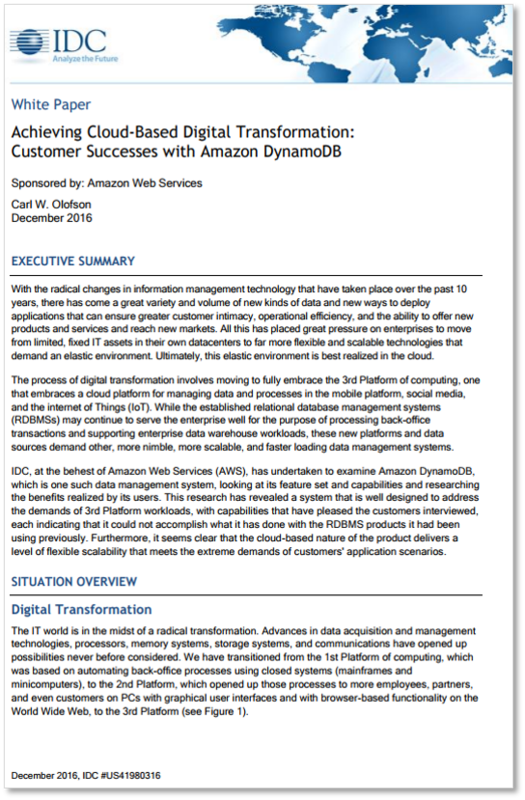 According to these organizations, Amazon DynamoDB has not only proven to be a cost-effective NoSQL solution but also well designed to address the demands of 3rd Platform workloads, which capabilities that have pleased the customers interviewed, each indicating that it could not accomplish what it has done with the RDBMS products it had been using previously. Furthermore, it seems clear that the cloud-based nature of the product delivers a level of flexible scalability that meets the extreme demands of customers' application scenarios.